Today's Earthlings are lured to Mars for a variety of reasons. Mars—"an incredible natural laboratory"—is reasonably easy to get to, and the U.S., at least, has a proven track record there, noted Lori Glaze, NASA's acting director of planetary science. "Trying to understand how life is—or was—distributed across our solar system is one of the major questions that we have," Glaze said Wednesday at a news conference. "Are we alone? Were we alone sometime in the past?" In two years, NASA will actually seek evidence of ancient microbial life on Mars—if, indeed, it's there. On Monday, the space agency announced Jezero Crater as the landing site for the Mars 2020 rover, which will gather samples and stash them for return to Earth in the early 2030s. The crater's ancient lake and river system is brimming with diverse rocks, making it a potential hot spot for past life. Michael Meyer, NASA's lead scientist for Mars exploration, said the Martian surface is too cold and dry, with too much radiation bombardment, for life to currently exist. Recorded observations of Mars—about double the size of Earth's moon—date back to ancient Egypt. But it wasn't until the 19th century that Mars mania truly set in. Italian astronomer Giovanni Schiaparelli began mapping Mars in the 1870s and described the observed channels as "canali"—Italian for channels. But with the recently completed Suez Canal on many minds, "canali" became understood as artificial, alien-made canals. Ray Bradbury's classic 1950 novel, "The Martian Chronicles," kept up the Mars momentum. All the observations and reports coming back from NASA's robotic explorers at Mars will help the human Mars pioneers, according to Thomas Zurbuchen, chief of science missions for NASA. That's the charm of Mars, according to scientists. I think our fascination is based on the impossibility for the foreseeable future of visiting any one of the trillions of other planets in the Galaxy, and the extra level of difficulty involved in any of the other planets in our solar system. This is exciting since finding out on Mars core will help understand Earth and terrestrial planets in general. The discussion of humans visiting other systems leaves me cold, precisely since we don't know if it is even possible. In other news, Nasaspaceflight forums posted Voyager 2 particle data that implies it may have joined Voyager 1 into interstellar space during the last few days. So FWIW a modicum of interstellar travel is possible, and even scientifically interesting. That gash on the side of the planet clearly shows a near miss by the Death Star. I agree. 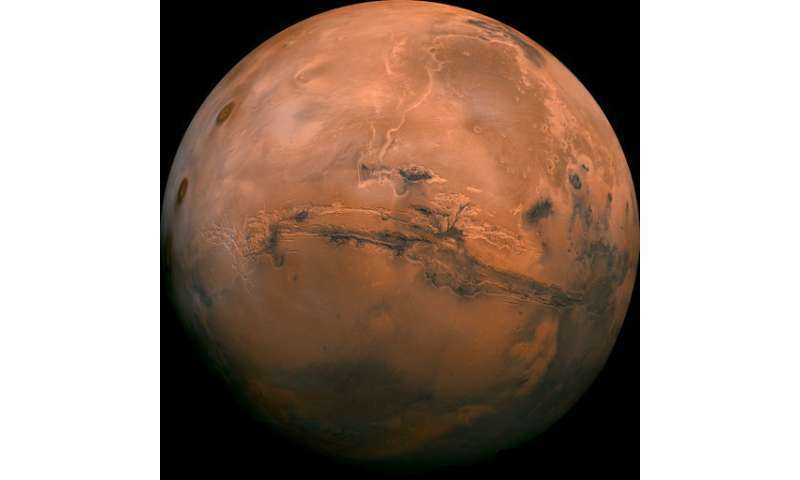 Knowing the many similarities between Mars and Earth, as well as the differences is exciting. It is best to fully understand what is and has been going on within and elsewhere on a planet for which future astronauts are being trained and preparations being made to send them to a hostile environment from which they may never return home. We still have much to learn about the Earth's environs, which is an ongoing experience. I don't foresee interstellar space travel happening for another 500 - 1000 years for humans. Solar radiation is one thing, and it is possible that a good solution to that radiation might be found soon for the protection of future astronauts to Mars. But interstellar radiation is a whole different area of which nobody knows what effect it would have on the human body. Thanks for that I shall go have a look. Make up your damn minds? If Earth sciences are is so damn interesting? How about more support & funding for research here on Earth? It is not the vaguely few, trivial similarities that may be discovered between the Earth & Mars, that are important. It is whatever differences we find on Mars that will propel a multitude of sciences forward. For instance, the thousands of mineral combinations that are unique to a Living World's active geology, hydraulic cycles & biological processing. What we discover on Mars will be a lot simpler but unique to it's own history. I expect most of the Mars enthusiasts too collapse. Sobbing out their bitter disappointment when it finally dawns on them the reality of limited output. One might hope they would show an adult level of equanimity. But, well, don't hold your breath! Instead I hope they would calmly accept the results. Using the actual data collected, as a motivation for further exploration of other dead, failed worlds. InSight can teach us how our solar system's rocky planets formed 4 1/2 billion years ago and why they turned out so different. Well, Mr Barnerdt, if you start off with the wrong assumptions then you will struggle to get to a satisfactory answer. Since planets ( and stars for that matter ) cannot "form" all by themselves from clouds of dust ( I'd like to have someone demonstrate that this can and does happen ) then they must have been created that way. That is the only explanation that can account for all the anomalies we find in the solar system: Venus turning the wrong way, Uranus rolling on it's side, Jupiter with half the rotational energy, pluto and moons that are still geologically active, Mercury that still has a magnetic field that is rapidly decreasing, earth with lots of water, comets that still exist(with none in the Kuiper belt or mythical oord cloud) etc.etc.etc. Fred, go be pious somewhere else. Fred, go be an ignorant bloody clown somewhere else. While I try to refrain from blatant ad hominem fallacies in my comments, yeah, that's exactly what I mean.